A Cold-Room the interior of which is maintained at below ambient temperature, typically well below freezing point. We can store wide range of product from at temperature 0Â°C up to 20Â°. In cold Room there are automatic defrost by utilizing a heater to defrost the condenser coils, which cycles on and off, preventing any ice build-up. Such ineffective solutions lead to excursions in temperature conditions that affect the quality of the stored material over a period in time. Cold Rooms can be utilized for multiple applications in the Pharmaceutical, Cosmetic, Food & Beverages, Dairy & other industries for all kinds of products intended for storage at low temperatures. Power supply: 230/415 volts 50 Hz main supply. Also available with 60 Hz Cycle. HMG Walk-In-Incubator is medium to large sized versions of growth &storage of bacterial cultures, gentle incubation & conditioning and Media Preparation.They are supplied at customer-site in a knock-down condition & can pass through standard sized doorways. They are assembled on-site. SS 304 Interior & Exterior either SS 304 or Powder Coated G.I. Digital Temperature Controller / Indicator, Audio Temperature Alarm, Strip Curtains, Inner Storage Racks etc. 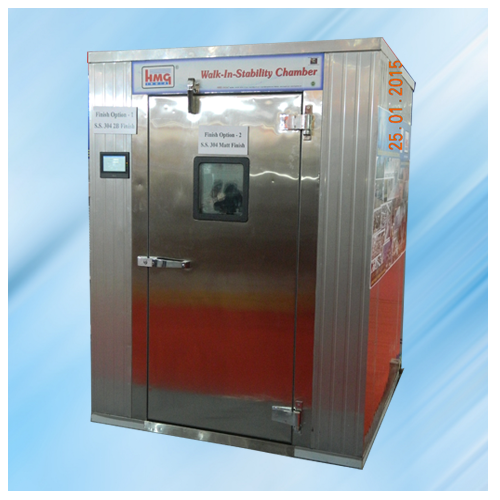 HMG Stability Test Chamber is specially designed to carry out stability & shelf list test on drug & drugs substance/product varies with time under the influence of a variety of environmental factors suchas temperature and humidity in large quantity. Hence stability test chamber is also known as Environmental Test Chamber. These are medium to large-sized chambers that are custom-built to ensure that they not only fit optimally in your lab's stability area but also address your large-scale stability testing requirements. Stability testing for Drugs & Pharma industries. Testing electronic/ Electrical components as per IS, IES, JSS, & Mil standards. Inner S. Steel heavy gauge, outer CRCA powder and coated finish. PUF in-situ foam about 3" thick. Humidity Injection System with low water level cut off. Microprocessor based controller with PID action for Dry/Wet, Direct % RH, safety alarm. Control Accuracy of temperature & humidity. Uniformity of conditions throughout the chamber. Direct display of humidity in % RH. Pt 100 sensor for dry / wet bulb or capacitance type humidity sensor available. PC interface with RS 232-C / or RS-485 for multiple networking of controller. Built in high / low conditions alarm. Low water level cut off device. Complete stainless steel chamber also available. The Light Weight & "Modular Design Assembly" makes it easy to fabricate room of any size. Dismantling, Enlargement & Relocation of the room is equally quick & easy. 24 G Prepainted CRCA / GI Powder coat finish / stainless steel / Aluminium. Chemical resistance : The panels are totally resistance to chemical agents & hence suffer no damage due to reaction. Water Resistance: The Panels are water resistant. Fire Resistance : The panels are excellent fire retardant. The Sturdy design & long lasting finish ensures negligible or minimum maintenance for years. Light Weight Panel available in various following sizes to suit a variety of applications. 1) Circular (Daily/Weekly) or Strip Chart (Continues) Recorder. 3) PC Interface through RS 232 - C/RS 485 for multiple networking of controllers. 4) Window based Software for reports in Tubular / Tabular/Graphical form. 5) Validation: HMGoffers validation protocols for DQ, IQ, & PQ documentation.